DUG Insight User ManualFrequently Asked QuestionsFrequently Asked Questions Views and DisplayHow do I display a horizon with its contours in 3D View? 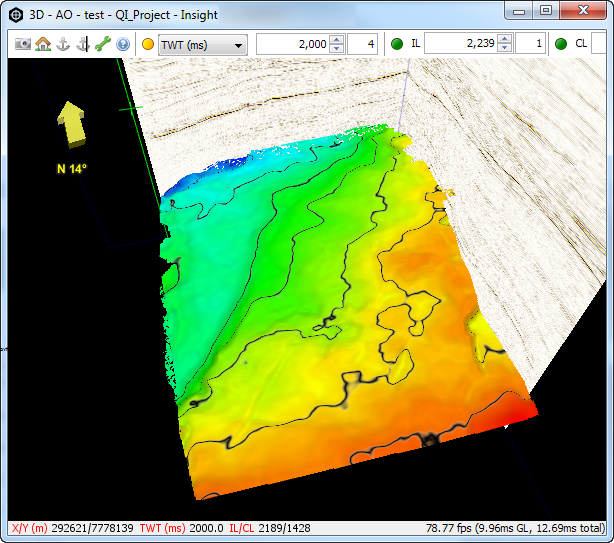 Contours are generated in the Map View (see Contouring in Map View). 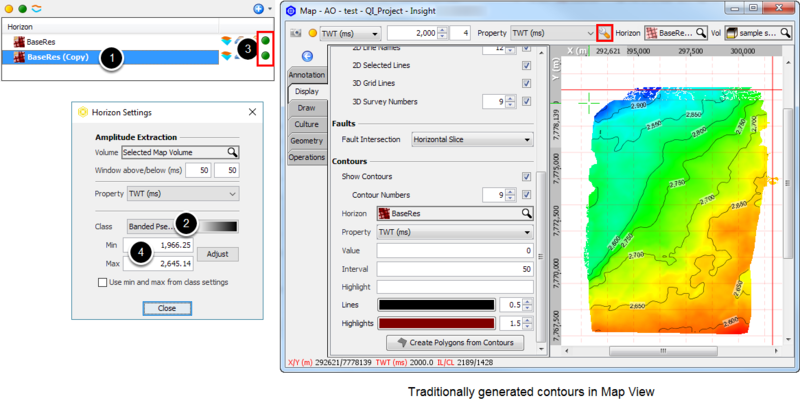 To display it in 3D, we can create pseudo contours to simulate 3D contours. Make a copy of the horizon you wish to contour (see Copying a Horizon). Create a new Class (see Creating a Class) and import the attached "banded_PseudoContours_10.ducolbar" coloubar (see Importing a Colourbar). Change the class of the Horizon Copy to the new class. Make sure both horizons are turned on and displayed in 3D View. Because the banded colourbar is largely transparent, you can still see the original horizon, but with the discrete black lines overlaid. Manually adjust the min/max cut-off values of the copy so that the black lines fall on exact values. The colourbar will be divided into 10 bands between the min and max values. For example, in the following image, the difference between the min and max values is 500, so every 50 will be black lines (interval = 50). In the screenshot below, I have included the Map View with the equivalent traditionally generated contours displayed for comparison. Next: How do I pick contours in Insight?